(Newser) – John Kerry revisited Vietnam yesterday, reviving old memories and trying to maintain good relations with a former enemy—particularly over the tricky issue of climate change, Bloomberg reports. "It’s weird," he said, looking at the murky waters of the Mekong Delta, where he engaged in combat more than 40 years ago. "It brings back stuff." No surprise there: He earned a chestful of medals for fighting in Vietnam and sparked his political career by publicly opposing the war. 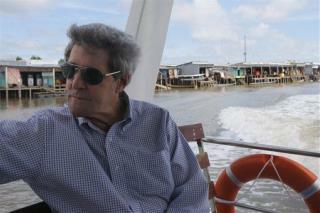 He also helped mend fences with Vietnamese officials over the years, and now, on a 3-day trip, he aims to help businesses that may drown amid the Delta's rising sea levels. Did he put himself in for any more Purple Hearts while he was there? The man is a disgrace! Just like jane fonda. Looks like somebody is running for President again. Free publicity for the ultra rich.